Individuals: send a letter to your Senator now. 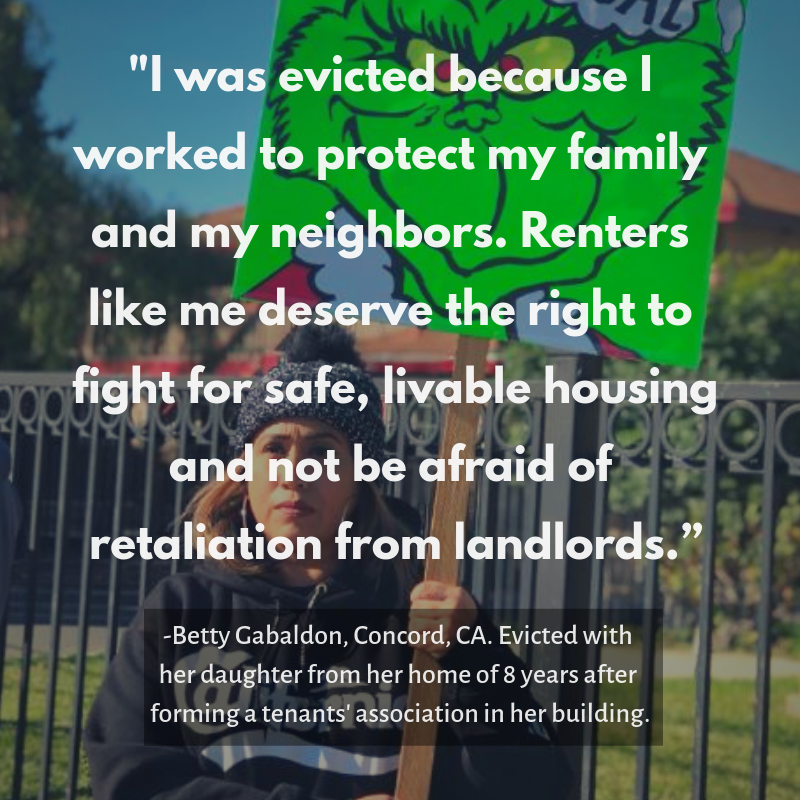 Tenants: if you have a story about organizing and being retaliated against by your landlord, submit your story and your photo here. ALL: Download our one-page and two-page flyer and reach out to your community and networks. Over half of California renters are cost-burdened, paying more than 30% of their income towards rent. ⅓ of renters pay more than 50% of their income towards rent. Half a million California tenants face court eviction every year, and far more are displaced by rent increases and eviction notices. Only 20 out of 482 cities in California protect tenants against rent hikes and arbitrary evictions. California renters face an enormous power imbalance. Allowing them to organize tenants’ associations and protect against retaliation by passing SB 529 empowers the victims of the housing crisis to have their voices heard locally and statewide.With wages stagnating and rents higher than ever, California’s 17 million tenants deserve a union at work and a union at home. SB 529 supports this growing movement by establishing a right to organize. With attacks on unions from Trump’s Supreme Court and a new wave of grassroots labor action sweeping the nation, collective bargaining is more important than ever. California’s 17 million tenants deserve a union at work and a union at home. Rogue landlords are evicting renters for forming tenants’ associations and utilizing their right to withhold rent to address repairs, bedbugs, mold, and other critical health issues. It is unjust to allow tenants who are suffering to be silenced, when homelessness is one eviction away for so many. 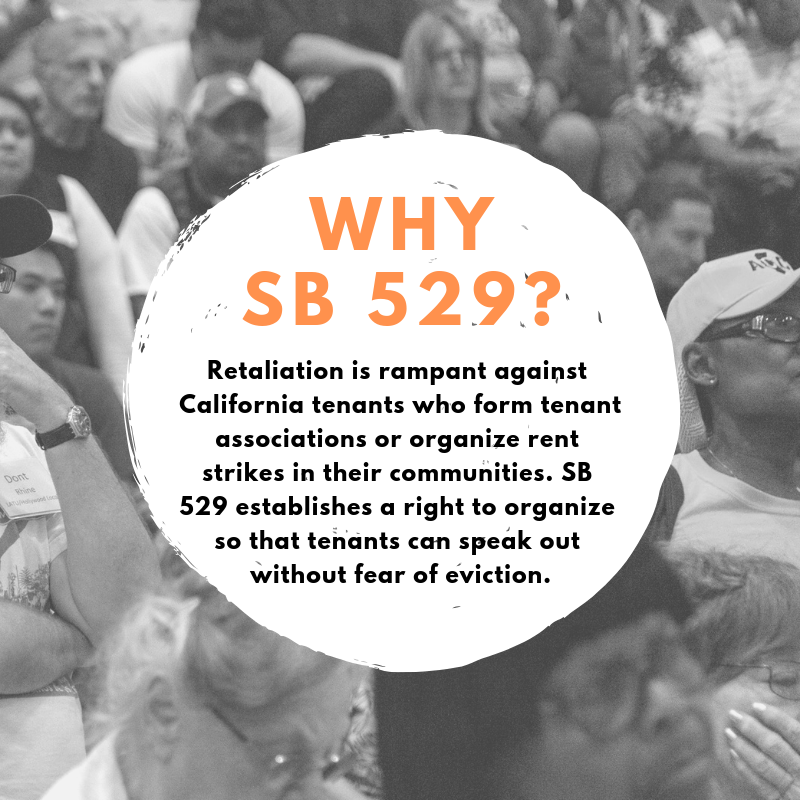 SB 529 is a fair, commonsense protection that allows tenants to band together for safety in numbers in order to hold bad landlords accountable. Tenants Together proposes that California Civil Code include a codified right. Tenants living in housing owned and/or managed by the U.S. Department of Housing and Urban Development won the right to organize in 2000. We need to ensure strong organizing rights exist for all tenants. Betty Galbadon, a Tenants Together member in the city of Concord, lived in her home for eight years with her young daughter. A few months ago, Betty received a 60-day notice of termination of tenancy following her efforts to organize her building and form a tenant association to improve living conditions. The notice stated no reason for the eviction, as allowed under California law. They were forced to leave their home and move to a new city. Betty was evicted for organizing, plain and simple. Just Cause: No eviction of the tenants in the tenant association except for cause. Right to Strike: A right to engage in rent strike – landlord must bargain in good faith about grievances and may not evict for nonpayment during the negotiation period. Enhanced Penalties: Statutory penalty of five times current penalties for retaliation or violation of this law, and in no event less than $1,000. Q: Retaliation is already illegal in California. What’s the point of this bill? Retaliation against tenants is rampant across California, we see this in our work every day. It’s nearly impossible to prove retaliation, and tenants just can’t take the risk of losing their homes in this housing crisis. This bill gives real protections for tenants who band together with their neighbors to make their voices heard. California allows a landlord to evict a tenant without even stating the reason for eviction. Retaliatory evictions hide in that loophole and we are trying to close it. The only way to stop retaliatory eviction is to make landlords state the reason for eviction. That’s not too much to ask; it’s common sense. Q: If you require cause for eviction, it will make it impossible for landlords to evict bad tenants. This bill does not stop a landlord from evicting a tenant who engages in misconduct. In fact, landlords can evict those tenants on three days’ notice. Our bill simply requires the landlord to state the reason for the eviction when evicting a tenant association member. This is necessary to protect vulnerable tenants who are simply trying to assert their rights together. Q: Won’t the rent strike provisions allow tenants to live rent free? Isn’t that unfair to landlords? A rent strike is always a last resort. Most landlords will be unaffected by these provisions. But for the bad landlords out there, the tenants need to have a way to collectively assert their rights without being evicted. Our bill simply delays the rent payment for up to a month while the landlord and tenants meet to negotiate the dispute. Without this, tenants are evicted immediately over the rent. This bill gives a cooling-off period for the landlord and tenant to try to work out the issue. Under the terms of the bill, the landlord will get their rent money at the end of the rent strike period. Q: There are a lot of tenant bills being introduced. How does this one fit in? State law needs better protections for tenants in this affordability & displacement crisis. We welcome a range of bills to address rent hikes and displacement. This bill is the product of six months of discussion among local tenant organizations across the state. These groups agree that these protections are essential so their members have the right to organize for greater local protections without being displaced in the process. Tenant groups are working to pass local rent control in cities across the state, to repeal bad state laws like Costa-Hawkins and the Ellis Act, to and protect tenants who organize. All are essential parts of the struggle for housing justice.